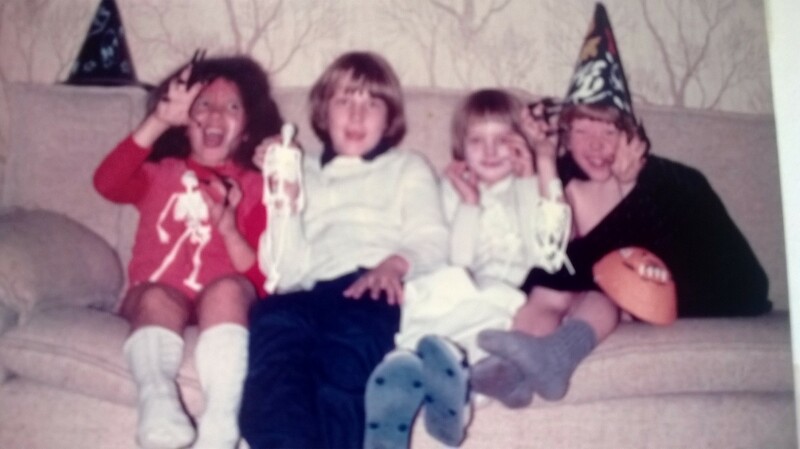 I have read a number of recent blog posts and commentary arguing that Halloween was never as ‘big’ as it is now, however I differ to this thinking as I remember Halloween being an important part of my childhood, perhaps a little less commercial, for example costumes were fashioned from existing clothes but still a time of fun and treats. This could be down to my Celtic connections, Halloween was always celebrated, bobbing for apples and 50p pieces, jumping up to the syrup pudding and getting dressed up, always followed the next day by the Holy Day of Obligation Mass. We were often in Scotland at my grandparents for Halloween as it coincided with half term and so its a time of year I always associate with them. Sadly, my lovely Gramps died on Halloween when I was 18 and fifteen years later I was back in Scotland for the half term week for my Grandma’s funeral. That week has also been a busy time for family birthdays so there were often lots of cousins and family up with my grandparents too, happy childhood memories. Halloween is also a significant date in my life, not only did I lose my Gramps on the date when I was 18, a wise, kind and loving man but on Halloween when I was 25, I met my husband. I like the symmetry of these two men ‘sharing’ a date as they have so many shared characteristics, love, kindness, family values and responsibility. Sixteen years ago Halloween was a miserable, wet and cold Saturday night and I was out in town with a friend to see a band, the sort of night you wouldn’t go out in but we wanted to see the band, it was only a gig in a pub and they never made it big! When we left the pub we ran to the nearest club for a dance and a few more drinks and there on the dance floor I met my husband, I even remember the song playing, Daydream Believer by the Monkees. Whilst our wedding anniversary is important, Halloween always has a little more significance, its our day! Our plan for today is a trip to a local attraction which has free entry for everyone in fancy dress. We went a couple of years ago and it was brilliant, stunning costumes and lots of Halloween treats with a great atmosphere. We have our Halloween picnic ready. Before we leave we will pop over to the neighbours to show them our costumes, I’m a witch, Little Miss a gothic bride, her choice following the Phantom House at Disney and Little Man is Frankenstein. When Daddy gets home from work tonight we’ll play some traditional Halloween games, it just isn’t Halloween without apple bobbing!